Lots of Windows 8 systems are being previewed at IFA in Berlin, including the Series 5 and Series 7 from Samsung, a new line of tablets with the South Korean company's S-Pen stylus and optional keyboard dock to transform the tablet into a laptop. Prices start at $649 for the Intel Atom Z2760 based Series 5 Slate, it has a 11.6" multitouch screen with 1366 x 768 pixel resolution, Windows 8, 2GB DDR3, 64GB storage, Gigabit Ethernet with adapter, 802.11a/b/g/n WiFi, and Bluetooth. It measures 11.6" x 7.2" x 0.38" and weighs 1.65lbs. The keyboard dock costs an additional $100. The Series 5 Ultra has a 13.3" multitouch screen but the same 1366 x 768 pixel resolution. This Windows 8 model packs the Core i5-3317U processor, 4GB DDR3; 500GB HDD with 24GB ExpressCache technology, Gigabit LAN, 802.11a/b/g/n WiFi, and Bluetooth 4.0. It measures 12.4" x 8.6" x 0.66"-0.78", weighs 3.83lbs and has a $849 price tag. The third model is the Series 7 Slate, this Core i5-3317U based Windows 8 system packs a 11.6" multitouch screen with a 1920 x 1080 pixel resolution. It measures 11.6"x 7.2" x 0.5", weighs 1.89lbs and has a $1,199 price tag. It comes with 4GB DDR3, 128GB storage, Gigabit LAN with adapter, 802.11a/b/g/n WiFi, and Bluetooth 4.0. Samsung Electronics America Inc., a subsidiary of Samsung Electronics Co. Ltd, today announced its new Series 5 and Series 7 Slate PCs. The new products can easily transform from a traditional clamshell PC to a Slate device with just the click of a button, maximizing both productivity and mobility. Designed for Windows 8 with Samsung’s advanced engineering and a ten-point touchscreen, users can easily stay connected and productive from everywhere. Additionally, Samsung today announced a new touchscreen version of its popular 13-inch Series 5 ULTRA laptop. Both the Series 5 and Series 7 Slate PCs have a Samsung S Pen conveniently embedded in a slot on the device. With 1,024 levels of sensitivity, the S Pen is designed for natural and intuitive content creation, and offers features including handwriting to text conversion and varying thickness when drawing or writing, depending on the pressure applied. Slate PC users can also take advantage of preloaded Samsung services such as MediaHub, which make it even easier to access entertainment and apps on your device. 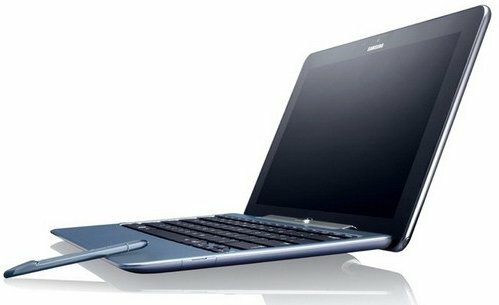 Weighing less than two pounds, the new Samsung Slate PC is designed to go anywhere. The keyboard dock attaches with a mechanical hinge so that users can pick up the device with one hand without fear of the pieces separating. The keyboard and display were designed as one device and the components fit seamlessly when connected. This design also makes the device easier to use, carry and store. Samsung’s renowned design inspiration is evident through the device’s curved edges and smooth lines. Both the Series 5 and Series 7 Slates feature an 11.6-inch display. The Series 7 display is 1920×1080 resolution; the Series 5 has a 1366 x 768 resolution. The Series 5 ULTRA features a 1366×768 resolution display with Samsung’s SuperBrightTM Technology (300 nits). The Samsung Series 7 Slate was designed with power users in mind. With an Intel Core i5 processor, 4 GB of RAM and a 128GB SSD, it satisfies the needs of even the most demanding users. Whether you’re building a presentation while multitasking on email and the web or editing photos while listening to music, the Series 7 Slate has the power to get the job done. The Series 5 Slate is also a powerful device, designed with the everyday user in mind. With an Intel two- watt processor, 2GB of RAM and a 64GB SSD, this device keeps you connected to work and play from everywhere. For users looking for a traditional clamshell laptop, the touchscreen Series 5 ULTRA laptop offers powerful components including a third generation Intel® CoreTM i3 or i5 processor, 4GB of RAM and a 500 GB hard drive with 24 GB of ExpressCache. ExpressCache results in faster boot-up and start times for frequently used programs. The Series 5 and Series 7 Slates, as well as the touchscreen Series 5 ULTRA, will be available beginning on October 26, 2012. The MSRP for the Series 7 Slate is $1,199. The Series 5 Slate will be available both with the keyboard dock, for an MSRP of $749, or without, for an MSRP of $649. The MSRP of the new Series 5 ULTRA will range from $799-$849.